Lanyon’s prints related to his paintings and their themes. He produced linocuts, monotypes, etchings and lithographs . Ground Wind (lithograph, 1961; see 1981 exh. cat., no. 75), based on his gliding experiences, depicts the merging land, sea and sky; by drawing the image directly on to the lithographic stone, Lanyon achieved a freer treatment of the subject. 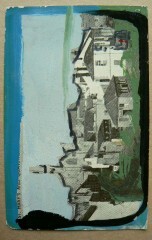 Postcard of Penzance with hand painting by Peter Lanyon.